These handy desktop tent calendars are the quickest reference for dates and holidays. Perhaps even faster than looking up the date on your smart phone! School holidays are shaded. Public holidays have a dark background with the date reversed out. Many clients use them to send to their customers as a year-long reminder of their company, product and service offerings. Extremely cheap printing for this very effective form of tactile marketing. Printed full colour 1 side on 350gsm satin artboard. Diecut to shape with standing knife. Packed flat. Desktop Tent Calendar Printing – your artwork or ours! 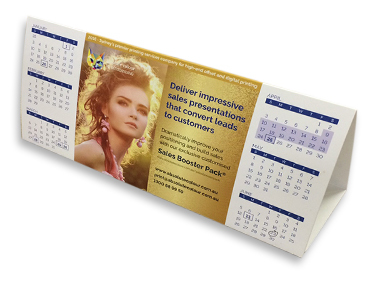 Keep your branding in front of your clients for 12 months.A printed calendar with your logo sitting on your client’s desk all year round creates brand loyalty and familiarity. Your logo displayed prominently every day, is easy for clients to recall when it comes time to place an order for your service or product. 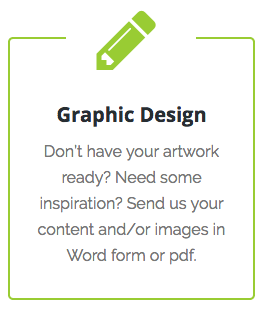 These are great to mail out with your newsletter or other promotions. Desktop tent calendars are not likely to be discarded. They are a very useful promotional giveaway at low cost. If your calendar shows school holidays and public holidays at a glance, is often the strongest reason clients hold on to them. It’s faster than referring to your phone or computer to look holidays up. You can create your own using our template or send your logo and company details and our designer will create it for you. Cost from $44.